Hanoi (VNA) - Vietnamese people have a friend in Europe that is the Netherlands, Prime Minister of the Netherlands Mark Rutte said at the end of his one-day official visit to Vietnam at the invitation of his Vietnamese counterpart Nguyen Xuan Phuc. The Dutch Government leader told the press before leaving Vietnam on April 9 night that people of the two countries are getting closer to each other, and he and PM Nguyen Xuan Phuc have formed a close friendship that has enabled them to discuss various issues, especially opportunities for both sides. 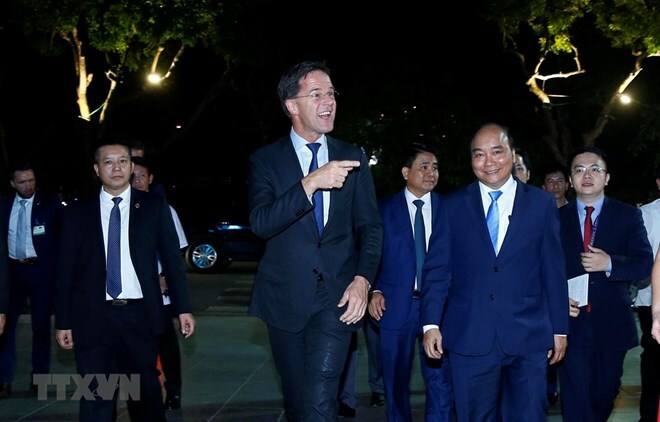 Noting that the Netherlands is a big investor in Vietnam, Rutte said 70 firms that accompanied him during the visit will stay in Vietnam for the next three days to sign many contracts on agriculture, water management, off-shore wind energy and logistics. He added that many other enterprises of the European country are also seeking cooperation opportunities with Vietnamese partners. The Dutch PM lauded Vietnam for its efforts in sustainable development despite a range of challenges, citing the example of the Mekong Delta, where 20 million people are suffering from direct impacts of natural and environmental changes. The local residents have learned how to adapt to these changes instead of combating them, he added. With most of its area below the sea level, the Netherlands can share its experience in this regard with Vietnam, the PM said. Talking about air pollution, which has remained a big problem to the Netherlands, he said the country has planned to close coal-fired power plants by 2030 and is implementing some projects on off-shore wind, solar and geothermal energy. The Governments and firms of the Netherlands and Vietnam are discussing cooperation in off-shore wind power, he said. During the visit, the second to Vietnam by Rutte since 2014, the Dutch PM held talks with PM Phuc, paid a courtesy visit to Party General Secretary and President Nguyen Phu Trong and met with National Assembly Chairwoman Nguyen Thi Kim Ngan.